First, I should make a disclaimer. Coloring, no matter how good the tool, is just not my best thing. When I was in elementary school, I was always jealous of another girl who could color so evenly and stay between the lines. She kept her hair pretty and neat too, whereas mine was doing good to be untangled. Fortunately, I'm not having to have my work graded these days and I keep my hair short :-) We could call my coloring - um - artistic! 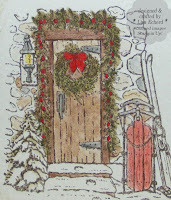 Since this is Sale-a-bration time for Stampin' Up! and you get something from the SAB catalog for every $50 you spend, markers and watercolor crayons may be a great addition to your wish list. I'm no longer a demonstrator, but I do like to take advantage of this opportunity as a customer. Before I purchased these coloring tools, I wasn't sure which I wanted to invest in - markers, crayons or pencils. Today's tips will focus on the benefits of the markers and the crayons. Stampin' Up! also sells waterolor pencils; however, they do not match the SU! colors. The markers and crayons both match the SU! color families and the neutrals. Classic refill inks can be used to refresh a marker so they last a long time. Eventually I understand the tips may wear down. Markers are used to color in images, but more importantly to color stamps. 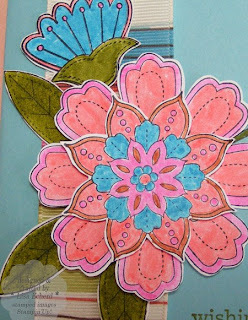 If you have a flower stamp for example and you want the petals in one color and the center in another, you just use the markers to color before stamping. In the card below, I used the markers to color "happy birthday" from a greeting stamp that had other words on it giving me just the greeting I wanted. There are two tips - a fine tip for writing and coloring detail and a brush tip usually used on a stamp or for coloring larger areas. Markers can color on any type of paper you would normally stamp on since they are the same ink as Classic (dye) inks. Watercolor Crayons: These also come in sets for each of the 4 color families and a set of neutrals. They are not available in In Colors or for individual purchase. Crayons are less expensive than markers. Crayons are usually used with blender pens to color in images or add a little color around an image. If you are really artistic, you can just do your own images, I suppose. The colors typically come out more subtle than the actual shade in ink; however, you can keep applying color to darken the image. 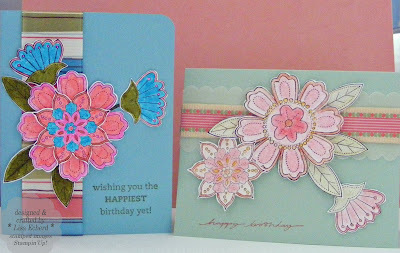 Both cards above use Cameo Coral - a marker on the left and the watercolor crayon on the card on the right. What a difference! Because of their subtle coloring, you can use blender pens to apply color to select elements in a detailed image without coloring every part as in this Home for Christmas design. Blender pens usually work best on watercolor paper or a paper with a slightly rougher texture. I often use the office supply store white cardstock as I mentioned in last week's Tips. So these are both great product with their own advantages. Personally, I have two sets of markers and three sets of the crayons. I doubt I'll ever buy the markers in Rich Regals since I just don't use those colors very often. I might buy a few individuals. 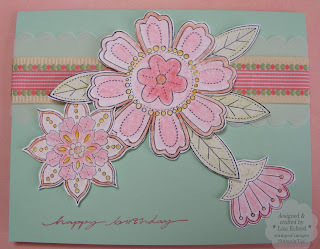 Ingredients for both cards: Stamp Set: Petal from Stampin' Up! ; On Your Birthday for Greetings also from SU! Cardstock and ribbon from unknown sources.